We're proud of all of our products, but this one stands above the rest. 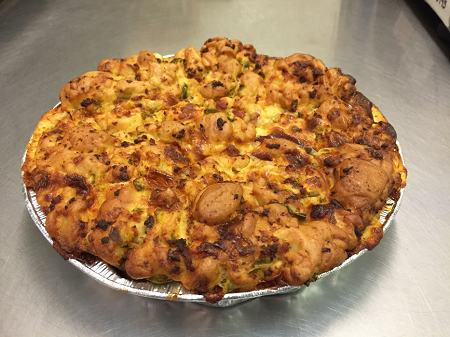 Our homemade bread is stuffed full of our smoked sausage, jalapenos, and cheese, and saying it's delicious is an understatement. This specialty bread is a must buy - locals love it! Cut this up and used it as an appetizer at a house party. People were raving about it and some even started dipping it in the queso cheese. Delicious! I have enjoyed Bourque’s jalapeño sausage cheese bread for over 20 years. I’m a native of Lousiana, but moved away 22 years ago. I get my Cajun food fix by ordering food from Bourque’s. I have never been let down in the taste or the quality. Recently I located the Bourque's business card which had been tucked away for several years. When my husband and I drove from Florida to Kansas we discovered Bourque's and fell in love with the sausage, cheese bread. We went out of our way to get it every time we took that route. I was so happy to find the web site and immediately ordered two loaves of the bread. I wasn't disappointed. It's still fantastic. I shared it with friends who also really liked it. I'll order more. Worth the shipping, this stuff reminds me of home in Louisiana. It's super addictive, order 2 at least, you'll eat the first one so fast! World famous, only wish I had a closer source. Always the hit of our company picnic in California. 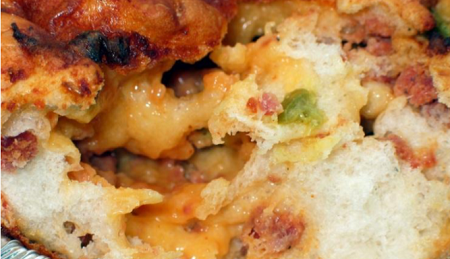 It's been about 3 years since the last time I had one of your jalapeno Sausage & cheese bread. It's still just as yummo as it was back then! Q: can this product be frozen ? A: Yes, this product can be frozen for a short period of time. To defrost it for serving, we recommend sticking it in an oven at 350F for several minutes.